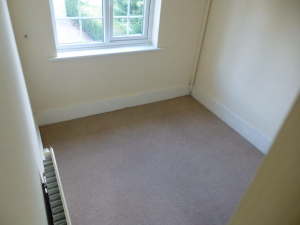 Have you ever looked at an empty house when you’ve been house-hunting? 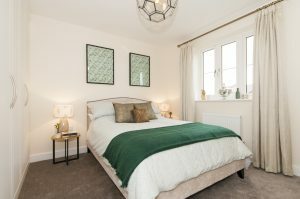 Online, the photos are pretty much a parade of ‘two walls and a bit of carpet’ for the living and bedrooms, with a shot of the toilet for the bathroom image. The kitchen is the only room that looks half interesting, and that’s because it’s got lots of fitted stuff in it. There’s no real way of identifying the rooms, no way to know how big or small they are, and absolutely nothing to grab your attention let alone make you fall in love with the place. If you go to see an empty house, the viewing either takes half the time it would take to view a furnished house because you simply walk into each room and back out again, bored. Or it takes twice as long because you walk in and out of rooms trying to figure out whether your furniture will fit, and you investigate all the cracks in corners and dodgy paint lines that you wouldn’t even notice if there was furniture there. It’s usually an awkward and unfulfilling experience (unless you’re me, in which case I LOVE an empty. But I’m an odd ball with an over-active imagination, and you can bet your bottom dollar that I’ll be wanting money off the asking price in return for use of said imagination). Now think about the times when you’ve viewed a beautifully furnished and well presented house. How did it make you feel? I bet you found it easier to imagine your lifestyle in that house rather than the empty one. I may be describing the buyer experience here, but really I’m talking to sellers. It’s important to consider the buyer experience because that’s who you need to please in order to sell well! And that’s my point, always: to sell well, you have to make it EASY for buyers to buy. This applies whatever you’re selling, but when we’re talking about the most expensive purchase most people will ever make in their lives, I think it has special relevance. It may cost a bit in terms of time and money, but in my experience what you get back in increased sale prices and faster transactions more than makes up for it. I wouldn’t do it on all my own refurb houses if I didn’t truly believe it’s worth my while! If you’re selling an older property, then you can beg, borrow or steal (no actually, not that last one) furniture and accessories from your own home, family or friends. Charity shops are a fantastic source of low-cost furniture and other items. 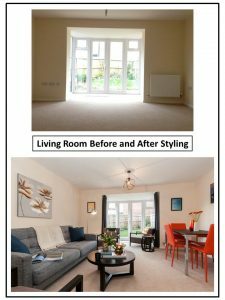 If it’s a new-build or newly refurbished property then you might be better off hiring new furniture from a rental company on a short-term basis, so that your furnishing and presentation fits with the new look of the property. Give me a yell if you’d like help with selling an empty property, I love them!